"Restaurateur Robbie Jordan is ready for the boost in business a local music festival brings to South Lick, Indiana, but the beloved event strikes a sour note when one of the musicians is murdered . . .
June’s annual Bill Monroe Bluegrass Festival in neighboring Beanblossom is always a hit for Robbie’s country store and café, Pans ‘N Pancakes. This year, Robbie is even more excited, because she’s launching a new bed and breakfast above her shop. A few festival musicians will be among Robbie’s first guests, along with her father, Roberto, and his wife, Maria. But the celebration is cut short when a performer is found choked to death by a banjo string. Now all the banjo players are featured in a different kind of lineup. To clear their names, Robbie must pair up with an unexpected partner to pick at the clues and find the plucky killer before he can conduct an encore performance . ."
Death Over Easy was another enjoyable addition to one of my favorite cozy mystery series! I usually struggle with keeping up with all of the series that I like to read but for some reason that doesn't seem to be the case with my favorite cozy mystery series. 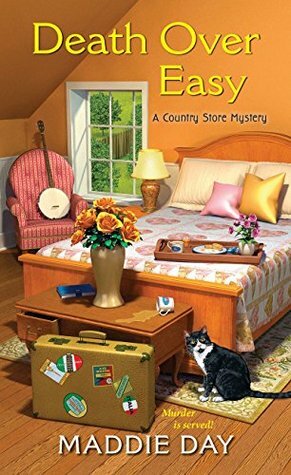 This is the latest addition to the Country Store mystery series and it once again reminded me why I love this series so much. There are just fun and enjoyable reads! In this one, the book is loosely centered around a Bluegrass Festival so there is lots of scenes featuring Bluegrass music and instruments. I can't say that I've ever been to a Bluegrass festival myself but I enjoyed reading about it regardless. As always, my favorite parts of the book are when Robbie is prepping food in her restaurant or cooking in her restaurant during the breakfast rush. Everything she makes always sounds delicious which makes me hungry while reading! Books like this sure do make me wish I was better cook than I really am. There is just something almost comforting to me reading this series. I'm always just swept away back into Robbie's life. The mysteries are fun but aren't what draws me back to these books time and time again. Instead it is the different characters, the cozy towns, and in this case, Robbie's cooking that keep me coming back for more! This book was just a fun read and I can't wait to read the next one! Overall, this was another enjoyable addition to this cozy mystery series! Was it the best out of the series or my favorite? Probably not but I still enjoyed my time with it and am ready for more! I'll be impatiently waiting for the next book in this series but until then it looks like this author has a new different cozy series that recently released that I need to check out! I love when that happens! I can easily recommend this series to other cozy mystery lovers and suspense fans. I do think that you would enjoy these books more if you read them in order but you absolutely do not have to! The author does a really great job with giving you enough background information that you could dive straight into this one without feeling lost. But as there are only four books in this series (five counting this one), I would recommend starting at the beginning if you can. Recommended! Bottom Line: Another fun read in this cozy mystery series! Disclosure: I received a copy of this book courtesy of the publisher and NetGalley. Thoughts are my own. I can imagine this would be a fun mystery. When I got to small Texas towns I love checking out the stores that take you back to another time.